Did you know that you can make your own cereal at home? I’m not talking just granola, I am talking full-fledged bran flakes coupled with big juicy raisins, dried apricots, crunchy almonds, sweet rolled oats, and crunchy quinoa. Designer cereal at its best. Well, if you did already know that, I wish you would have told me about it. I just realized it and I think it’s amazing. If only I had known about it years ago…. Prior to clean eating, I was a bit of a cerealaholic. I lived on cereal the year before graduate school. I was making good money at a tech job, but in an effort to double and triple my car payments every month and have money set aside for graduate school, I lived like the struggling artist that I strove to be. I had a tiny studio apartment: I could fry an egg, get dressed for work, watch the news, and brush my teeth without having to move an inch. I had an egg sandwich as I ran out the door (I had to move my car by 7 am to avoid a parking ticket) and every night I devoured bowls of cereal while reading cookbooks before heading off to play rehearsals or auditions. After graduate school, I still kept my cereal habit. I had my basic cereals: Cheerios, Fiber One, Crunchy Oat Bran, and then my designer, ‘treat’ cereals like Blueberry Morning and Raisin Nut Bran. My pantry looked like a showroom for Kelloggs and General Mills. When Manatee and I decided to come clean, we knew our cereal habit had to go. Cereal was chock full of chemicals and preservatives, not to mention, it’s really expensive. It was tough, but we made it. After staying clean, our taste buds readjusted and anything store bought, even the tree hugging organic granolas, were too sweet for our tastes. Fast forward to present day: I’m pregnant and I want my cereal back. 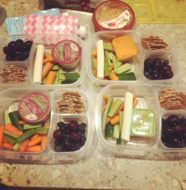 But between the latest scary recalls and how my taste buds pucker at the overly sweetened cereal flakes found in processed favorites, I was at a loss. Then I started google searching. 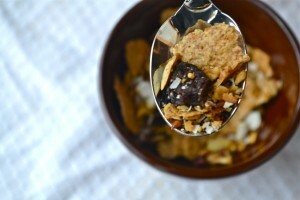 Unbeknownst to me, bloggers everywhere have been making their own bran flakes at home. Couple that with a modified granola/muesli recipe and Eureka! Homemade Cereal! 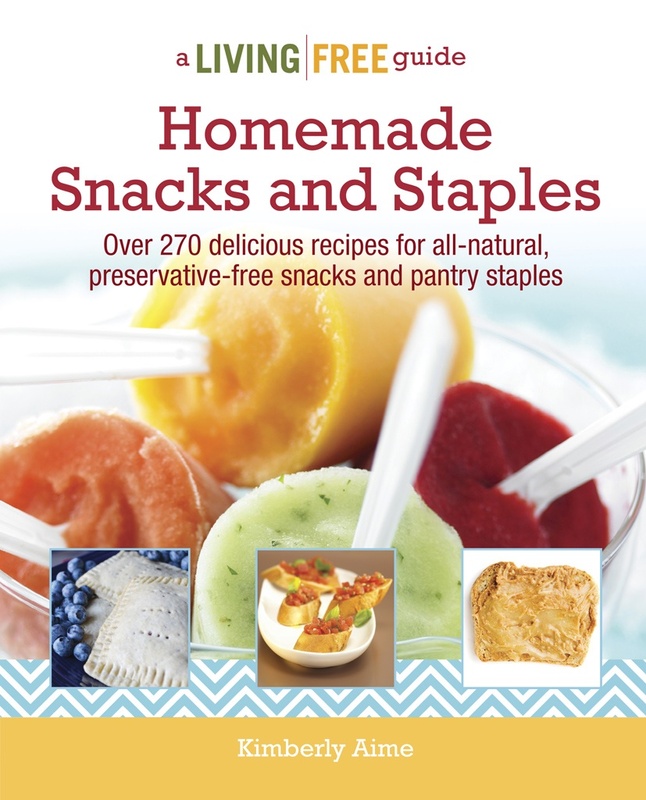 Today you are going to get 2 recipes for the price of 1. For me, these two recipes go together so well that I can’t imagine tucking into a bowl of one without the other. Sweet, crispy, and packed with all of your favorite ingredients. 1. Preheat oven to 325 (dgF). 2. Combine ingredients for Base (oats, nuts, seeds, quinoa, and cinnamon) in a large bowl. 3. In a small saucepan, combine maple syrup and oils and heat over medium heat until coconut oil melts and syrup is fully dissolved. Stir in vanilla. 4. Pour Binder into Base ingredients. Stir with a wooden spoon to combine. 5. Spread oat mixture out on two rimmed baking sheets. Bake at 325 (dgF) for 10 minutes. Stir and rotate pans. Bake an additional 10 minutes, stir, rotate. Continue this at 5 minute intervals until oat mixture is golden brown (it will continue to crisp after you take it out of the oven). I baked mine for a total of 30 minutes (10, 10, 5, 5). 6. While mixture is baking, combine Mix-in ingredients (dried fruits and coconut flakes) in a small bowl. 7. Let cool completely on cooling racks. Stir in Mix-ins on the baking pans. Transfer to airtight containers. 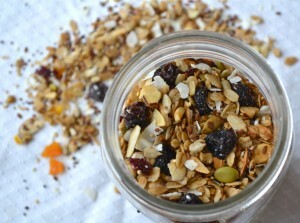 Granola Muesli will be good for up to 3-4 weeks. Homemade bran flakes with the slight hint of peanut butter goodness. 1. Preheat oven to 350 (dgF). 2. Combine dry ingredients in a large bowl (bran, oat flour, whole wheat pastry flour, sugar, salt, baking powder). 3. Stir in peanut butter and tahini. The dough will form a coarse meal. Break up the pieces as much as possible. 4. Add milk and water. Stir to combine. Let rest for 5 minutes. 5. While dough is resting, measure out 4 pieces of parchment paper to fit your baking sheets. 6. Place [1/4] of dough onto prepared parchment paper. Cover with plastic wrap and use a rolling pin to roll the dough as thin as possible. Remove plastic wrap and place parchment paper on baking sheet. Repeat. 7. Bake first two batches at 350 (dgF) for 12 minutes, rotating halfway through. While those 2 sheets are baking, roll out remaining dough on remaining parchment paper. 8. To cool, remove dough and parchment paper onto cooling racks. Bake the remaining 2 sheets. 9. Reduce oven temperature to 250 (dgF). Let cool completely and break the dough into slightly larger than bite sized pieces. Spread out on baking sheets. They can overlap. You should be able to get all 4 doughs on 2 baking sheets. 10. Bake at 250 (dgF) for 20-30 minutes, rotating pans and tossing flakes every 10 minutes. Bake until golden brown and crisp. 11. Let cool completely and store in airtight containers for up to 3 weeks. 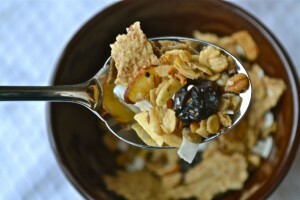 The Bran Flakes can be a little tricky the first time you make them, so check out this post for some helpful visuals that walk you through the whole recipe. This cereal has been my go-to for the last 3 weeks. I look forward to it. The Granola Muesli has just enough sweetness to feel like a treat. The cinnamon adds warmth and I love the chewy dried fruit. I am particularly fond of jumbo raisins and chopped dried apricots. Yum! Because of the sweet nature of the Granola Muesli, you almost need something to counterbalance it. The nuttiness of the Bran Flakes neutralize the sweetness and give the cereal more heft. All I can really say is that I hope you try it. This is a great recipe to make over the weekend and then have on hand for the week (or weeks) to come. 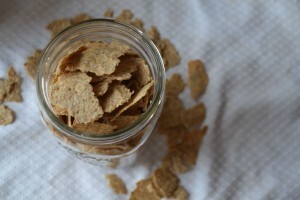 194 Comments on "Clean Eating Homemade Cereal"
I simply want to say I’m newbie to blogs and really loved this blog site. Probably I’m likely to bookmark your site . You really come with fabulous writings. Thank you for sharing your blog. mvzdvkuw,If you are going for best contents like I do, just go to see this web page daily because it offers quality contents, thanks! work and coverage! Keep up the excellent works guys I’ve included you guys to my blogroll. It’s appropriate time to make some plans for the future and it’s time to be happy. I have read this post and if I could I desire to suggest you few interesting things or suggestions. Perhaps you can write next articles referring to this article. I wish to read more things about it! Valuable information. Lucky me I found your web site unintentionally, and I am surprised why this accident did not came about in advance! I bookmarked it. This article is truly a pleasant one it helps new net viewers, who are wishing for blogging. when I have time I will be back to read much more, Please do keep up the great jo. ksetos,Some really nice stuff on this website, I enjoy it. I really wanted to compose a brief note to say thanks to you for these remarkable guidelines you are giving at this website. My prolonged internet search has finally been rewarded with reasonable know-how to exchange with my family and friends. I would believe that most of us readers are undoubtedly endowed to be in a great website with so many perfect people with beneficial plans. I feel quite grateful to have encountered your entire website page and look forward to many more excellent times reading here. Thank you again for a lot of things. You really make it appear so easy together with your presentation but I find this matter to be really one thing that I feel I might by no means understand. It sort of feels too complicated and extremely large for me. I am having a look ahead in your subsequent put up, I¡¦ll attempt to get the dangle of it! I wish to express my passion for your kindness in support of those people who require guidance on this important concern. Your personal dedication to passing the message along was extraordinarily important and has constantly allowed workers just like me to realize their ambitions. This warm and helpful hints and tips can mean much a person like me and further more to my office colleagues. Warm regards; from everyone of us. hhlhwgahbz,Definitely believe that which you said. Your favourite justification appeared to be on the net the simplest thing to remember of. It’s in fact very difficult in this active life to listen news on TV, so I just use web for that purpose, and take the latest news. the opposite experts of this sector do not notice this. You must proceed your writing. hello!,I love your writing so so much! percentage we keep up a correspondence more approximately your post on AOL? I require an expert on this area to solve my problem. May be that is you! Taking a look forward to see you. whoah this weblog is great i like studying your posts. Keep up the great work! You understand, a lot of persons are hunting around for this info, you can aid them greatly. head before writing. I’ve had a difficult time clearing my thoughts in getting my ideas out there. Valuable info. Fortunate me I discovered your website by accident, and I’m shocked why this coincidence did not happened in advance! I bookmarked it. pqprjpwein Adidas Yeezy,Some really nice stuff on this website, I enjoy it. engines for not positioning this publish higher! 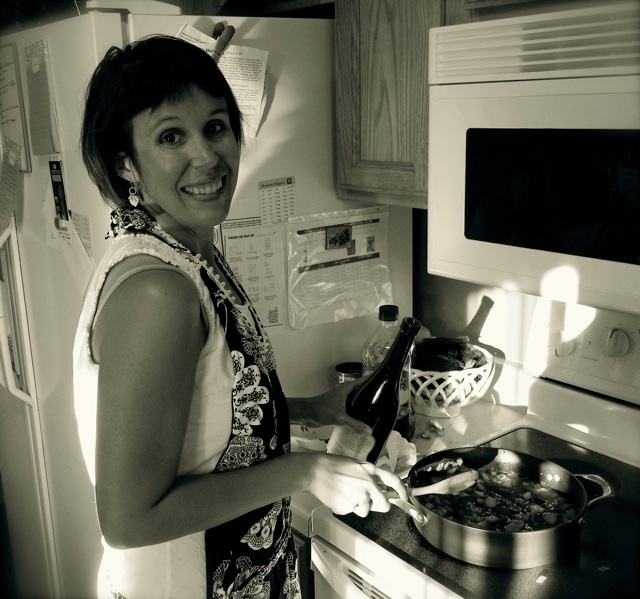 Come on over and talk over with my website . am visiting this web page dailly and obtain pleasant information from here daily. It¡¦s actually a nice and helpful piece of information. I am happy that you simply shared this helpful information with us. Please stay us up to date like this. Thank you for sharing. Next time I read a blog, Hopefully it does not fail me as much as this particular one. I mean, I know it was my choice to read, but I truly believed you would probably have something helpful to say. All I hear is a bunch of whining about something you can fix if you were not too busy looking for attention. Your method of explaining all in this post is in fact nice, every one can without difficulty understand it, Thanks a lot. Fantastic items from you, man. I have take into account your stuff previous to and you’re just too magnificent. Thanks , I’ve recently been looking for information approximately this subject for ages and yours is the greatest I have came upon so far. P6ua47 Your writing taste has been amazed me. Thanks, quite great post.